American's most famous architect Frank Lloyd Wright once designed a dog house for a dog named Eddie. It all started in the early 1950s, when Robert Berger of San Anselmo, California, asked Wright to design him a house that was "expandable, inexpensive, and easy for one person to build." A few years later, Berger's 12-year-old son, Jim Berger, wrote Wright a letter asking him to design a house for the family dog, Eddie. I am a boy of twelve years. My name is Jim Berger. You designed a house for my father whose name is Bob Berger. I have a paper route which I make a little bit of money for the bank, and for expenses. I would appreciate it if you would design me a dog house, which would be easy to build, but would go with our house. My dog's name is Edward, but we call him Eddie. He is four years old or in dog life 28 years. He is a Labrador retriever. He is two and a half feet high and three feet long. The reasons I would like this dog house is for the winters mainly. My dad said if you design the dog house he will help me build it. But if you design the dog house I will pay you for the plan and materials out of the money I get from my route. A busy man like Wright, who was supervising the construction of the Guggenheim Museum at the time, may have declined the project or declined to reply at all. But just over a week later, he responded...and his answer wasn't "no." A house for Eddie is an opportunity. Someday I shall design one but just now I am too busy to concentrate on it. You write me next November to Phoenix, Arizona and I may have something then. 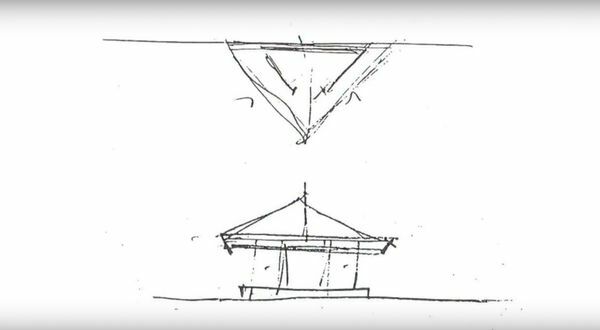 The young Berger did write back, and Wright sent him a full set of drawings for the project - a small, triangular dog house with a low-pitched roof. The original plans were more complicated than the young Berger had hoped, and the Bergers didn't get around to building it until 1963. When the dog house was built, Eddie and his successors declined to use it, and by 1973 the house was dismantled and tossed in the dump. 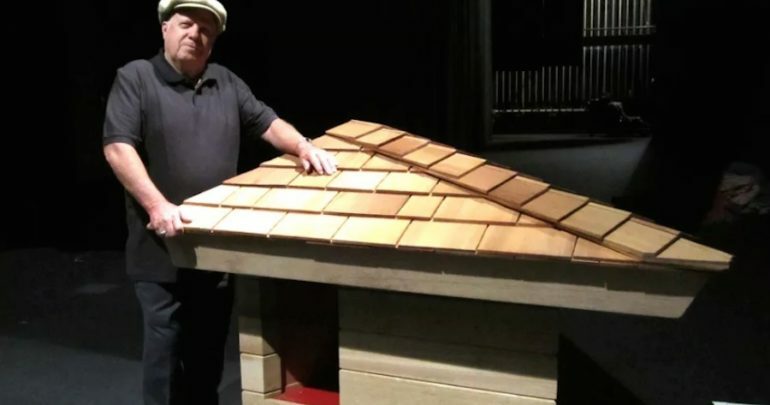 Recognizing how special the project was, Berger, who is now fully grown and a skilled cabinet maker living in Marin County, California, decided to recreate "Eddie's House," and in 2011, he received permission from the Frank Lloyd Wright Foundation to build a replica of the dog house from the original Wright sketches. Berger eventually donated the replica to Marin County Civic Center Library in May 2016, where it is housed inside the largest Wright building ever constructed, the Marin County Civic Center. As far as anyone knows, it is the only dog house Frank Lloyd Wright ever designed. What do you think of this story? Share your thoughts below. All images via Curbed San Francisco.